It was perhaps inevitable that as both an archaeologist and a long-time folky (and now morris dancer) I would end up looking at the material culture of English folk traditions. I've been fiddling around with this for the last year or so. 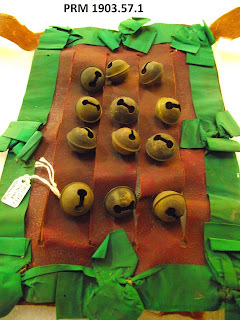 Finally, a month ago, I made arrangements to go and have a look at the various items related to Cotswold morris dancing that are held in the Pitt-Rivers Museum, Oxford. People usually associate the PRM with anthropological collections from across the world and are often surprised that it also holds material from England. There was in fact recently a really rather good project, called The Other Within, which looked at the various English material in the its collections. 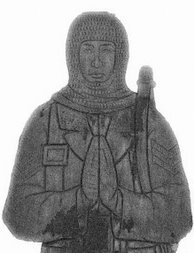 It was this that first drew the various morris ephemera to my attention. The project notes on these items were written by Mike Heaney and are excellent pieces of work, effectively exploring the provenance of these objects. However, from my archaeological perspective they did not really engage with the physical objects themselves terribly strongly. 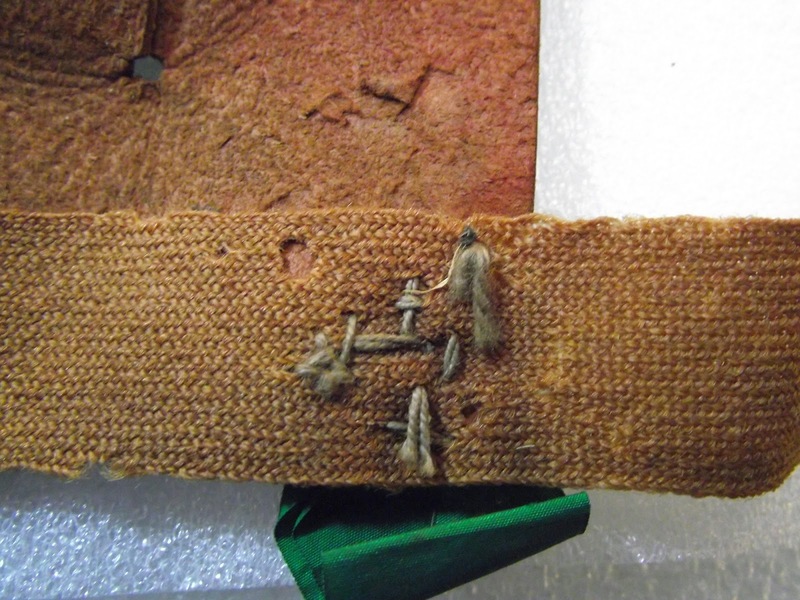 I'm really keen on an object biography approach for understanding them, and obviously the work on provenance is incredibly useful in this context, but its only half the story and does not really tackle the physical objects themselves. It was this that drew me to the Pitt-Rivers. Over the next couple of weeks I want to explore some of my initial thoughts and observations. These are probably fairly inconsequential, but hopefully will flag up some of the potential that can be derived from really exploring the physical dimensions of the items. 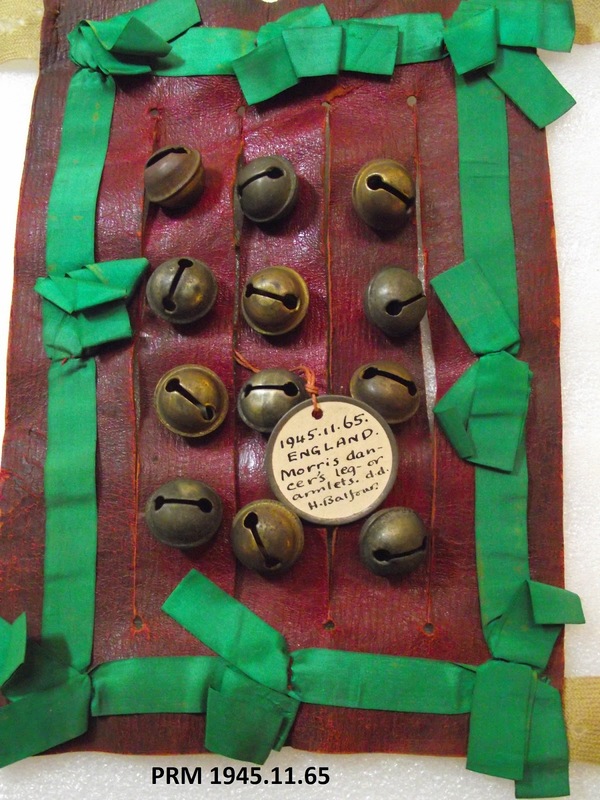 This description holds true of the other bell pads in this group. These were collected at intervals and were accessioned in 1903, 1917, 1945 and 2008. 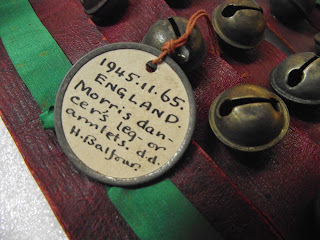 The all appear very similar; the earliest set (1903.57.1) have written on them “'Morris bell sets, made for the revival of Morris dances arranged for the Coronation festivities in Oxford 1902 (the dances were not held owning to the King's illness)”. Their similarity suggests that although collected at times they were intended as a set all for use in the 1902 festivities. But, a closer inspection suggests that the matter is not quite as simple as it seems. 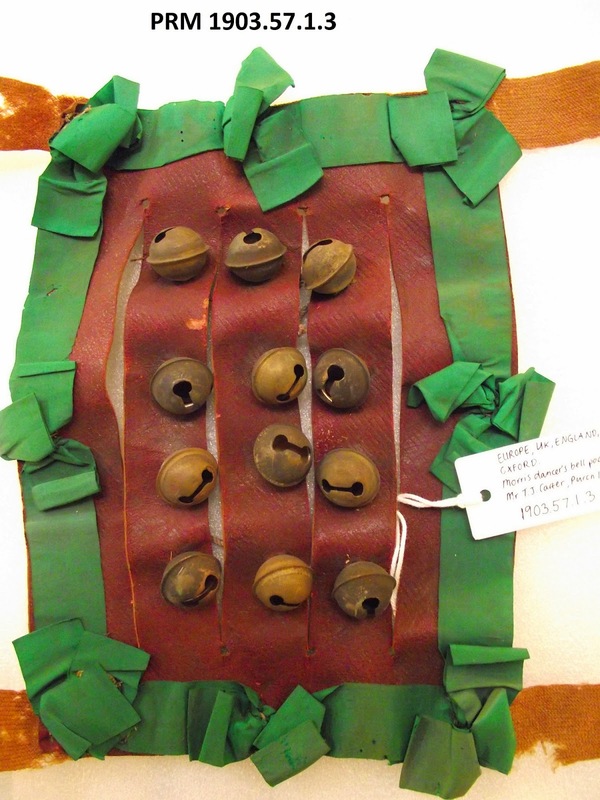 The 1903, 1917 and 2008 sets certainly appear identical, both in terms of the material used, and in the workmanship and constructional technique – looking at the reverse shows the bells are all attached in the same way using similar string, types of knots etc. It is hard to resist the conclusion that they are indeed a set, probably made by the same individual and certainly using the same stock of materials. Intriguingly, the 1945 set appear different. 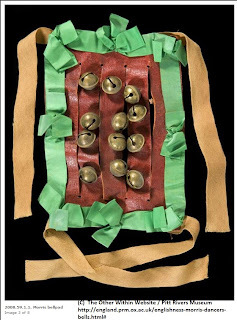 There are clear broad similarities, the types of bell, the leather sheet onto which the bells are attached and the colour scheme are more or less identical. However, there are also noticeable differences. First, although the green ribbon is the same colour, it is distinctly narrower than that on the other pads. There are also subtle differences in the crotal bells. Those on the 1945 have a narrower slot in them than those on the other pads do – they clearly come from a different source. When the pad is turned over there are other differences. 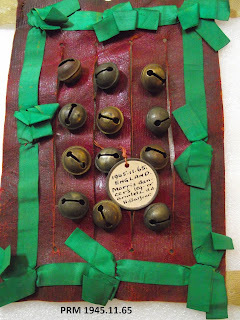 First, although the way in which the bells are held onto the pad is similar in that a string is run through the loop shanks of all four bells on each strip of leather, there are some subtle distinctions, most notably there is more string left over after the knot is tied at the top and bottom. Similar differences in construction can be seen when comparing the way in which the ribbon that ties the pad to the leg are compared. On the 1945 pad the ribbon is attached neatly by vertical groups of cross-stitches (I may have the technical term incorrect). On the others, the ribbon is attached by a less systematic cluster of simple stitches (again, I don't have the technical terminology). 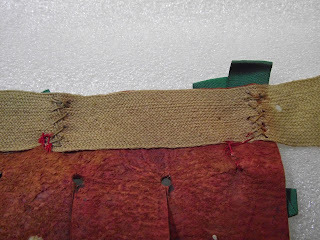 A final difference can be seen in the way in which the green ribbon is attached to the leather backing. 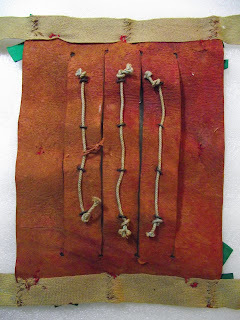 In the 1945 set, a red thread is used – this is distinct from the buff thread used to attach the ribbon on the same pad. In the other sets, the same buff thread is used to attach both the leg ribbons and the green ribbons. 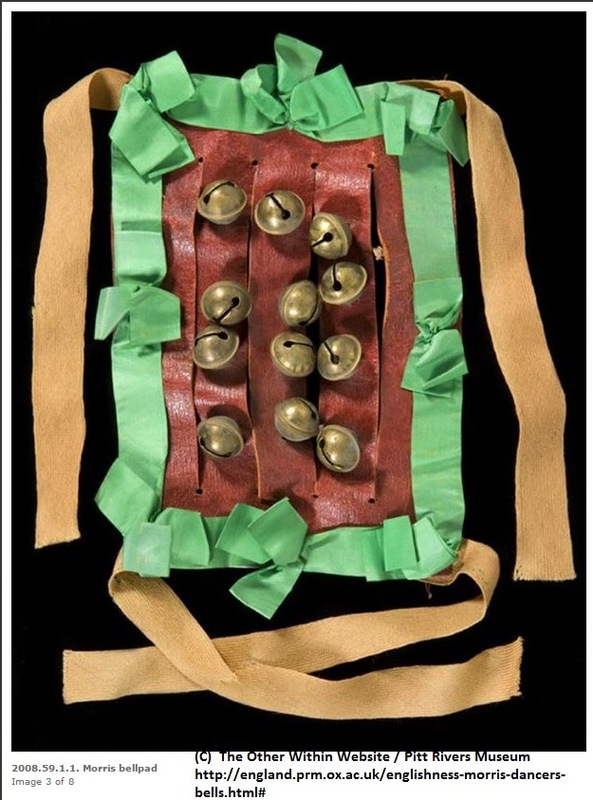 These differences in materials (bells; green ribbon; red thread) as well as the distinction in stitching and knot tying, clearly set the 1945 set apart. The only thing that actually links all the sets together are the broad colour scheme, layout and the noticeably the red leather backing, which does appear virtually identical on all the sets. The first two sets are recorded as being supplied by a TJ Carter (in fact the 1917 set says FJ Carter, but this is probably a mistake). However, the 1945 set are distinct enough in constructional technique and material to suggest that at the very least they were made by a different person, and quite possibly given the subtle variation in the materials, at a different time. So, is it possible to say when and why the 1945 set were made? Frustratingly, probably not. The 1902 morris display was a fairly precocious example of the morris revival – probably under the aegis of early collector and enthusiast Percy Manning – and noticeably before Sharp took an interest in the Headington morris. However, it was not the last pre-WWI morris dancing at Oxford. For example, the memoir recording the life of Oxford folk play enthusiast and keen morris dancer, Reginal Tiddy records that he was engaged in morris dancing in Oxford probably in the early 1910s. In the latest volume of the Morris Dancer by Roy Judge on The Oxford University Morris Men 1899 – 1914 records an event organised by the ‘Oxford Society for the Revival of the Folk Dance’ in October 1908 organised by Mary Neal and including William Kimber doing an exhibition dance. It is clear that the 1945 set were based on the 1902 set- but can be distinguished from them. One plausible scenario is that they were copied from them at some time in Oxford in the early 20th century, possibly for another early revival performance, such as the 1908 lecture. 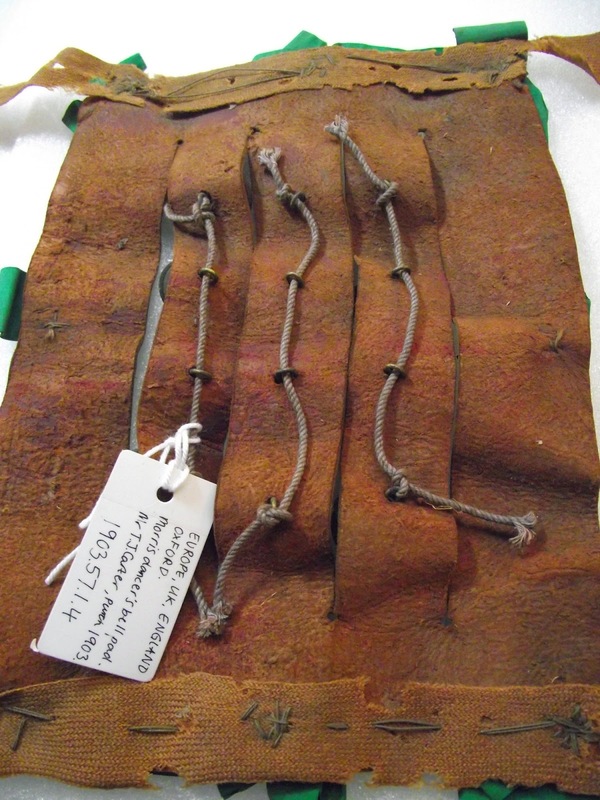 The similarity in the leather backing suggests that there may have been some direct contact between the individual or individuals involved in making both sets- perhaps even re-using elements from a 1902 set. 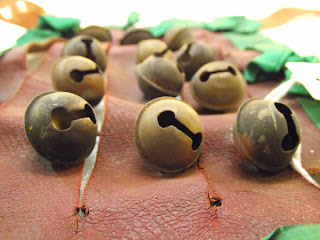 Overall, this does not radically change the interpretation of this group of objects – they are broadly similar in appearance and must have some kind of connection, although not as direct as Heaney suggests. More generally though, this simple analysis does show the value of returning to the objects themselves and subjecting them to a more detailed examination.